The man Plato is most visible to us in his famous Seventh Letter. Here he travels to Sicily several times to see if his ideas work there in educating the tyrant, his offspring, and friends. His efforts did not settle things. In fact, be himself was restricted for a time. Finding Plato in the many dialogues that bear his name is another matter. We know we are not reading verbatim transcripts of what Socrates said. Somehow, we seem to be reading something better. I came to appreciate Plato rather late in life. 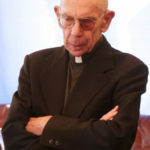 Much of my earlier thought was negative due largely to the critique of Father Charles N.R. McCoy, who saw in Plato the incipient errors of modern thought. McCoy was not entirely wrong. It has been rightly said that every intellectual aberration can find its roots somewhere in Plato. The opposite is true also. Most of what is good and profound is also in Plato. Several years ago, I began to teach a one-semester course on Plato to a class of some fifty students. In the course of one semester, we read all the dialogues of Plato except the Parmenides and the Timaeus. These latter are longer dialogues and more difficult ones, so I would need time I did not have. But the reading of the Platonic dialogues with a class is an exhilarating experience. The charm of Plato is catching. He makes us conscious of our immortal souls in a way that no one else can match. At the death of Socrates, the young Plato was mightily upset. He could not rest content that such an injustice went unpunished, even though, by all accounts, it seemed to. He wondered if there could be a city in which such an atrocity could not happen. He set his mind to the task. He discovered a city in speech or thought. He spelled out its conditions for us. But he was a realist also. He knew that in this world not all good deeds are properly rewarded and not all crimes are properly punished. The world indeed seemed to be made in injustice. Many injustices are not obviously requited. It looks like many get away with their crimes. Many a noble deed goes unrewarded. But the proposition that the world is created or exists in injustice was a maddening one for Plato, as it must be for anyone who considers its implications. Plato had listened carefully to Socrates when he talked about the soul. At the end of the Apology, we see Socrates’ reaction to his sentence of death. His accusers go to life but he to death – and he leaves us with “which is the better part” to the gods. But Socrates himself looks forward to conversing with the great ones who have already passed into the isles of the blessed. He was anxious to carry on his lifetime pursuit of wisdom even to eternity. He would no longer be encumbered by the body and its ills. So Plato resolved the reward/punishment problem. We may not be properly punished or rewarded for our deeds in this life, but this life is not all there is. After our death comes the judgment of each of our lives. What does our record show? Final resolution of the justice problem that so bothered Plato lies here. The world is not incoherent after all. Tyrants of any sort do not ultimately “get away” with their crimes. The circle is closed. The logic is tight. When Socrates lay dying, he asks that a sacrifice be made to the God of Healing, as if to say that in death, he is healed. He does not reform a disordered world but enters into the order that our souls were made for. The subsequent history of political thought has returned again and again to the proposition that we can build a perfect city, like the one in speech, in this world. We want a city in which Socrates is not executed but dies of old age, like Plato. Indeed, we want not to die but to stay in this world. We wonder if the gods have revealed anything more to us. And if so, how does it relate to the city in speech? Rumors also hint of a “City of God.” We listen. *Image: Plato’s Academy (or Seven Philosophers) by an unknown artist, c. 100 B.C. to 100 A.D. [National Archaeological Museum, Naples]. The mosaic was originally in the villa of T. Siminius Stephanus in Pompeii.